I want to introduce you all to two nifty little gifts I got for my birthday. Yes, it was weeks ago but I've been slack on the blog entries as of late, if you haven't noticed. I have no excuse other than a lot was going on and I was enjoying the remnants of summer. The first piece de resistance is the Batter Finger, a gift from my aunt in the Netherlands. She obviously knows my tendency to run my finger across the edge of the batter bowl, or even scoop a sampling from the middle. "Uh oh, have you been caught sticking your finger into that irresistible cake batter again?" the back of the package reads. "Next time, don't gross everyone out - use your Batter FInger instead!" 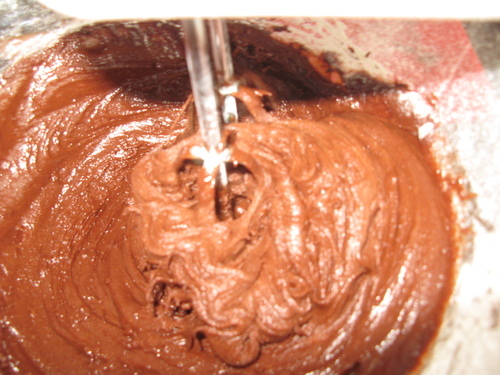 The silicone spatula can be used to stir and scrape, apply frosting ... and taste the batter, it says. Too cute. I can't wait to use it. My other new favourite gadget is iSi Easy Whip, which makes fresh whipped cream with just a few shakes of the bottle. It uses a nitrous oxide charger, or bomb as we like to call it. We've had one at the cottage for as long as I can remember. I believe it was my Dutch aunt who first brought one over. It always gets whipped out when we're having Oma's famous blueberry crepes. All you have to do is toss in a cup or two of whipping cream and a spoonful or two of icing sugar. Then comes the best part -- the bomb. It's the silver-coloured object below, sitting beside its holder. When you screw it in on the top, it hisses a little as a pin pierces the charger and lets out the gas. Then you shake the container three or four times and it's done and you can start squirting the whip cream from the nozzle. Instead of icing sugar, you could use cocoa or a flavoured liquid syrup. Or even Kahlua or dissolved vanilla sugar. Mmmmm, the possibilities. Now who's coming over for cake or a decadent breakie? Perhaps I have a little of my Oma in me. She adores apricots any which way. Last Christmas she steamed a bunch of them in the microwave, melted some white chocolate and served it as an appetizer. Mostly for herself. She also makes these crescent-shaped apricot stuffed cookies for Christmas. Me, I don't like apricots so much. That was before I tried these squares. It's a surprise I even found them. A small group of the little squares were hidden on a lower platter in the middle of a professional spread of food at a book launch party. Maybe it was because the squares were so obviously homemade, the only such goodies in a sea of designer tarts. Soon enough I was directing everyone within earshot, whispering loudly that I'd discovered the tastiest treat of them all and coyly pointing to the unassuming squares. Being a little tipsy at that point, I don't recall whether anyone seconded my opinion. But I've already been asked for the recipe. Unfortunately, unlike most of my favourite recipes, this one is no slapdash affair. Don't try to do this 30 minutes before you're due at a cocktail party. But my boss, who kindly allowed me to publish this recipe for the world to see and hopefully eat, has a little trick. And that makes it worth the consuming cooking time. She cuts the square into blocks and freezes them. Not only does freezing make it easier to cut the squares, it also makes it easier to pull these out for an impromptu party or one you're just to lazy to cook for. First, prepare your dried apricots. You want to rehydrate them so the end result melts in your mouth as opposed to gnawing through them with your teeth. 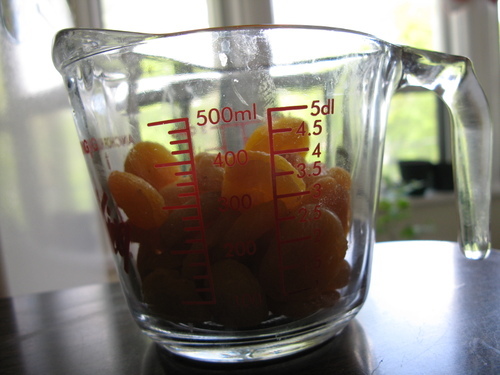 Put two eight-ounce packages of apricot in a saucepan and cover with water. Simmer until tender but not mushy. It may take about 15 minutes. I found that because I used two different packages of apricots, they cooked at different rates so I recommend sticking to one brand. 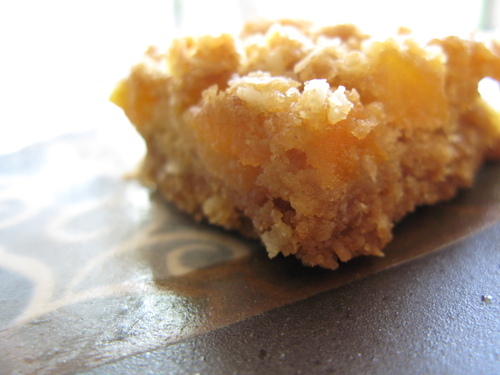 1 cup graham cracker crumbs. 1 cup sweetened shredded coconut. Take half a cup of the mix and reserve it for the topping. 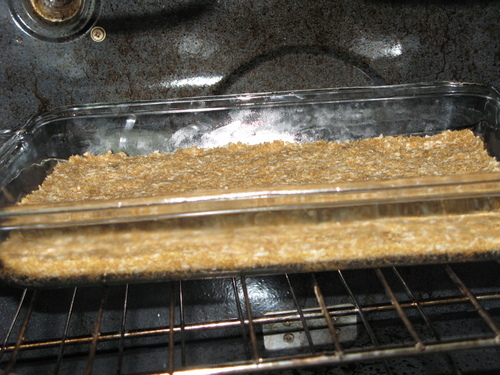 Dump the rest into a rectangular baking pan and press it firmly and somewhat evenly. 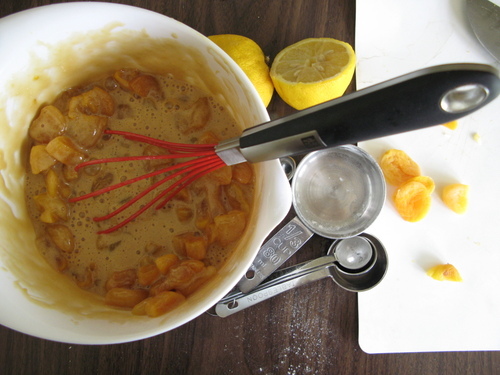 This is where the dreamy part comes in: mixing the softened apricots with sugary goodness. 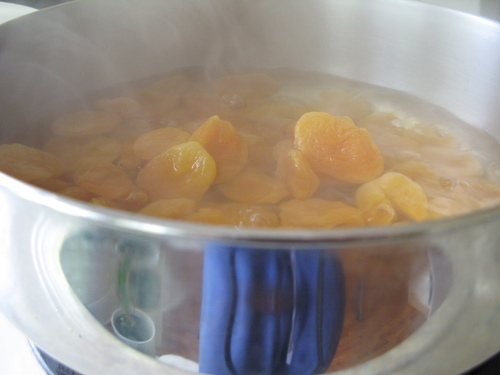 Cut the apricots into chunks, about three pieces each, and then add those too. Mix. Taste. And then spread over the graham base. I don't recommend dumping it in the middle since smearing the mixture around can cause cracks in the graham crust. I used my hands for this, seeing as they are more gentle than a wooden spoon. Or at least I hope they are. Sprinkle the remaining graham mix on top. Bake at 350 for 30 to 40 minutes, or until the edges have browned. Cut when cool. Even better, as mentioned before, you can freeze large portions and then cut when partially thawed just in time for that party you almost forgot about. Don't you just want to lick them? I know, I know. Your mom told you to never eat dough because it has *gasp* raw eggs in it and you could get Salmonella and die a slow painful death. Well, I'm not scared of no raw eggs. In fact I do recall my farmer dad regaling me with tales of his grandfather and his one-raw-egg-a-day regime. My father also dared my brother and I to gulp down a raw egg whole, for a prize, of course -- a calf. My brother won and made a fair chunk of change. In my house, cookie and other types of dough were always being eaten out of the bowl and off the beaters. When a Japanese woman came to live with us for a month, she introduced us to seaweed and tea ceremony; we introduced her the wonders of cookie dough. Funny that she thought us strange because it was living in Japan that I learned the savory pleasures of eating raw egg. There's nothing like sukiyaki, boiling thin strips of beef then swishing them in raw egg, or katsu-don, a breaded pork cutlet over rice and topped with onions and raw egg. All I'm trying to say is raw eggs aren't so bad. The creaminess they add to both dessert and dinner dishes has no rival. And so I urge you to make this most delicious Double Chocolate Brownie recipe and take the time to lick your beaters and bowl clean. If you're still too nervous about licking the bowl clean because of the egg, this recipe offers an alternative -- a bowl of chocolate, butter and cocoa that has to be melted down on the stove. Also very tasty. 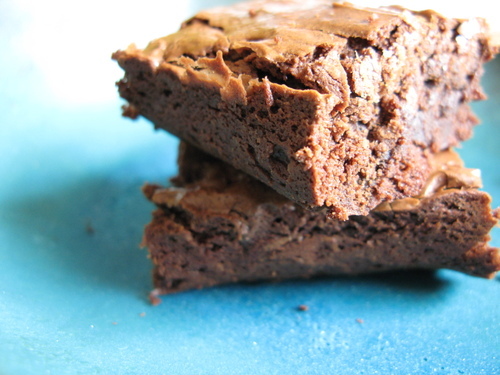 I decided to use some of my pricier chocolate for the brownies, just to give it added richness. Fortunately, I had just been at Soma Chocolatemaker in the Distillery District where I bought some of their Peruvian 64 per cent cocoa dark chocolate and a 75 per cent cocoa dark chocolate bar by Chocovic. In the end the dough was marvelous ... and the resulting brownies weren't half bad either. 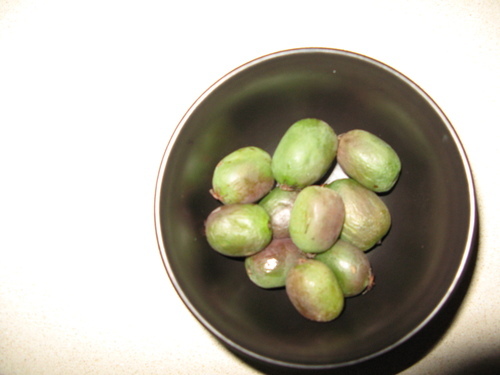 It was the overflowing pints of blueberries that caught me attention and drew me into a local fruit stand, but it was these mini kiwis that I walked away with. Kiwis the size of grapes. A few bucks for a wee container. Naturally, I grabbed them. No sooner did I have them in my hand and a woman was peering over my shoulder asking, "What are those?" "Mini kiwis," I replied, as though they were part of my weekly grocery list. Later, I read on blogs that this is the way to eat them. Still, my stomach revolted a bit. The next day, I bit a piece off the top and sucked out the kiwis instead. Perhaps not the most civilized method, but it did the trick. Tasty. Not sure how I'd use these little treats, other than as a snack though. On one blog, they sliced them in half and set them out on a fruit platter. Perhaps they could even go in an exotic fruit salad. Hmm, something to ponder.